August 2 - Saint Eusebius of Vercelli, Bishop - Optional Memorial - My Catholic Life! Eusebius was chosen bishop of the northern Italian city of Vercelli by popular acclaim in the 340s, even though he was an immigrant from the island of Sardinia. 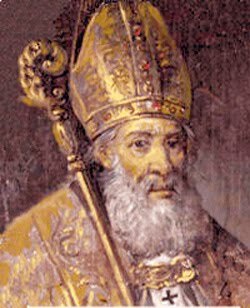 Twenty years after Eusebius’ death, the great Saint Ambrose, bishop of the nearby city of Milan, wrote to the Christians of Vercelli during a period of conflict in their diocese. Saint Ambrose’s letter survives and is valuable contemporary evidence of the great esteem in which Saint Eusebius was held by an equally great prelate. Saint Ambrose calls Eusebius “a great man.” Eusebius was great because of his close attachment to his city, to his priests, and to correct theology. Regarding attachment to his city, Bishop Eusebius was the first Christian of Vercelli and acted like it. He gave impeccable witness of poverty, fasting, and prayer. He did not see himself as the leader of only the Christians under his authority, but also of the still numerous pagans in the countryside around Vercelli. As one of the first bishops of northern Italy whose name is known to history, Eusebius lived early enough to have established the first, most basic structures of the Church. He promoted devotion to Mary in local shrines, founded parishes, and ordained and encouraged priests. He sought to promote Christian identity as more fundamental than one’s earthly identity. Rome will come and go, but the heavenly Jerusalem is forever, and all the baptized are future citizens of that heavenly city. Regarding attachment to his priests, Eusebius was innovative. He had been deeply influenced by Saint Athanasius’ Life of Saint Anthony, and so emulated that monk’s life of detachment, but in the midst of the city. Eusebius gathered his priests around him in a community of life which observed a monastic rule. They prayed, ate, and recreated together. They shared the concerns of their people with each other, and made those problems their own, as true pastors do. In living this common life, Eusebius and his priests gave a powerful example of Christian solidarity to the city they led. They also prefigured the various forms of diocesan community life which would proliferate many centuries later in the Church, most notably in the Oratory of Saint Philip Neri. Regarding attachment to correct theology, Eusebius’ life intersected with the intense theological polemics of the fourth century, which were themselves often intertwined with Church and imperial politics. Eusebius accepted, in full, the teachings of the Council of Nicea. He defended the Council’s wording that Jesus Christ was “consubstantial with the Father.” He was in good company in defending this proposition, but not in powerful company. The Roman Emperor was an Arian, and so held to a simplistic, albeit politically expedient, Christology in conflict with Nicene Christianity. The Emperor demanded that Eusebius, and other bishops, condemn the great flag-bearer of Nicene orthodoxy, Saint Athanasius. Eusebius refused, stating that Athanasius was innocent of any wrongdoing or error. For Eusebius, it was more noble to defend the truth than to curry political favor. So he was condemned to a long exile in faraway Palestine, and later, Asia Minor. He was mistreated, imprisoned, and abused by his Arian captors, including an Arian bishop. Theology in the fourth century was played for keeps, a zero-sum game in which whatever one player won, the other lost. The political winds shifted in 361 when a new Emperor who cared nothing about Christianity took power. Eusebius’ long exile thus ended. He returned to his beloved Vercelli and served there another ten years, his quiet and faithful service leaving no documentary trace, a faithful populace his lasting legacy. Saint Eusebius, you suffered for the truth, not just spiritually but physically. You endured exile from family, friends, and church rather than capitulate to false teachings. May your example inspire, and your intercession empower, all pastors and teachers to equal bravery. ST. EUSEBIUS was born of a noble family, in the island of Sardinia, where his father is said to have died in prison for the Faith. The Saint’s mother carried him and his sister, both infants, to Rome. Eusebius having been ordained, served the Church of Vercelli with such zeal that on the episcopal chair becoming vacant he was unanimously chosen, by both clergy and people, to fill it. The holy bishop saw that the best and first means to labor effectually for the edification and sanctification of his people was to have a zealous clergy. He was at the same time very careful to instruct his flock, and inspire them with the maxims of the Gospel. The force of the truth which he preached, together with his example, brought many sinners to a change of life. He courageously fought against the heretics, who had him banished to Scythopolis, end thence to Upper Thebais in Egypt, where he suffered so grievously as to win, in some of the panegyrics in his praise, the title of martyr. He died in the latter part of the year 371.